Have devastating life events outside of your control caused you or a loved one to give up hope, abandon your dreams, and made you feel as though you have lost control over your own destiny? Has all of this caused you to feel trapped, helpless, isolated, hopeless, and/or emotionally and physically exhausted? If you are visiting our web site because you are searching for hope, and a way to reclaim control of your life circumstances, then you have come to the right place. Our staff knows firsthand just how debilitating uncontrollable life circumstances can be. Unfortunately, many of us have personally experienced one or more of the life events that our services are designed to help. In addition, we are Human Resources and Operations executives who are experienced with making hiring decisions every day. All of this makes us uniquely qualified to empathize, dispense advice, and provide support to each of the populations we serve. 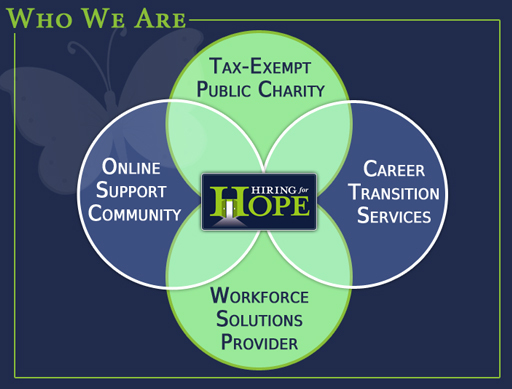 Think of Hiring for Hope as a career transition service, meets public charity, meets workforce solutions provider, meets online support community. We are not trained medical professionals. So, as you begin to take advantage of all we have to offer, remember that our services are designed to complement formal treatment and/or advice from medical professionals, and should be used accordingly. So, what are you waiting for? Take control of your destiny and begin the process of creating your new reality today. Don't worry, you won't have to make this journey alone. We'll be here to provide the necessary tools and support to help you and your loved ones every step of the way. So what could these groups possibly have in common? They all share a common bond – one of discouragement and hopelessness – brought about by very different reasons. This bond can flourish and work to everyone’s advantage if given a chance. 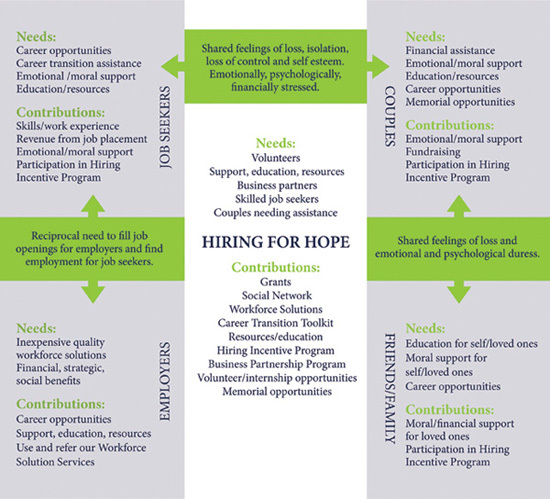 Hiring For Hope creates an environment and facilitates experiences among these groups that lead to a positive outcome for everyone involved. We believe, because of the commonalities among these groups, it made sense to unite them in a mutually beneficial networking relationship. This is precisely how Hiring For Hope was born. It is possible, and it does work. Job seekers contact us because they need moral support and assistance with their career transitions and job placement. Employers/business partners contact us because they have workforce challenges that they need solved, and/or would like to help us achieve our mission. Couples contact us because they are in need of hope, moral support, and financial assistance in order to overcome their obstacles to building their families. They may also be seeking support after suffering a loss. Friends and family members of impacted individuals contact us because they need education and emotional support for themselves and/or a loved one. We utilize the contacts in our national database and Voices of Hope job seeker social network to match the hiring needs of employers with the skill sets of our job seekers. Then we connect and introduce the two parties. When a hiring placement is made, we receive a fee from the employer for making the introduction and helping them fill their open position. The fees collected from these job placements, along with the funding realized from our Business Partnership Program and national fundraising efforts, make it possible for us to provide all of our free services and fund our Brave Little Soul Grant Program. In the end, everyone involved benefits from this symbiotic relationship. Our job seekers are gainfully employed and our employers/business partners have solved their workforce challenges and realized the significant financial, strategic, and social benefits associated with aligning their business strategies and initiatives with our cause. Those that require financial assistance to overcome their loss and/or obstacles to building their families now have hope and an opportunity to apply for some much needed financial assistance through our Brave Little Soul Grant Program.